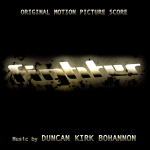 Download FIGHTER: The Unofficial Score! I had the awesome opportunity to write my first score for a feature-length film way back (rather, what seems like "way back") in the summer of 2008. What resulted was over 25 minutes of music for a wonderful film about fighting for your dreams. While the gig ultimately didn't work out — the filmmakers decided to go in a different direction, musically — I'm still extremely glad I took the chance. The film's writer and director, Roberto Froment, is a really awesome guy, and he has continued to help me fight for my own dream as I pursue my career as a film composer. Fighter, vis-à-vis the film, has gone through a few changes since 2008, including a renaming to Anything Goes (Vale Todo). It is slated to release to theaters and DVD on May 4, 2010; go watch it when it comes out!